I am going to tell you a story—a love story. We are old friends, the kind who have known one another since childhood. Back then, we met only once per year during summer holidays, enough to forge a friendship that has lasted since then. I have to admit that as I grew up and my interests turned around, our ties become looser and looser until few years ago, when my life made one of it periodic shifts. One of the implications of being a scientist is that you get to travel a lot and change the place you call home quite frequently. After my Ph.D., I moved to the U.S. to work at the Marine Biological Laboratory in Woods Hole, across the street from WHOI, where we reunited, as he was part of the research group I joined. Although we never worked together then, we spent four summers and three winters side by side, time that allowed us to better know each other. We become close friends. As usually happens, I didn’t realize how much I enjoyed his company until it was too late. A year ago I had to move again, as I was starting a new position at Brown University. Although we are not so far away from each other, I missed our everyday encounters right away. But who knows if destiny exists because even though now we seldom see each other, we interact indirectly during my work at Brown. This has allowed me to realize that he is full of surprises, and my enthusiasm about him and all his secrets has grown lately. However, it has been during this cruise that I finally have fallen in love with the Ocean. This cruise is full of first-timers, but I beat them all. For me, this has been the first time I enrolled on a ship, slept on a ship, lost sight of land, and saw only water day after day for weeks. I had to learn how to defeat seasickness while working hard at the same time. I became familiar with the ship’s murmurs and terminology, which is English at Foreign Language level 10000. I have loved it all. But what makes a trip like this so unique is the people on it, from crewmembers to my already familiar colleges. 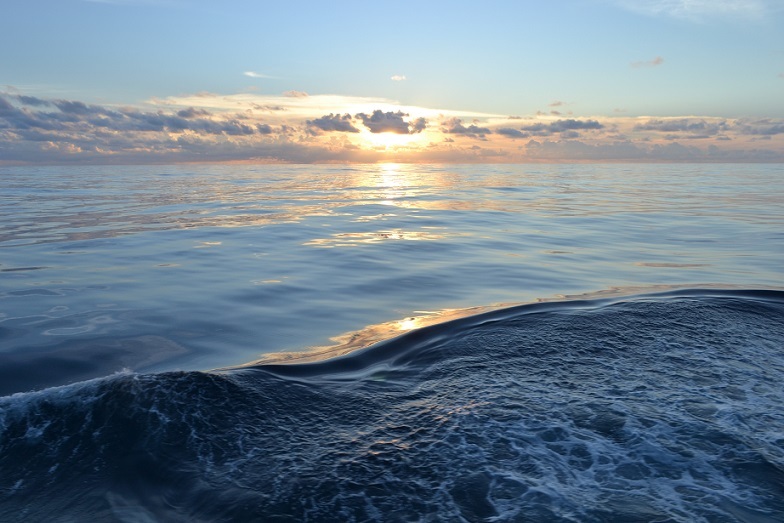 An oceanographic cruise is only possible because of a huge team effort, and it has been great to become part of it. 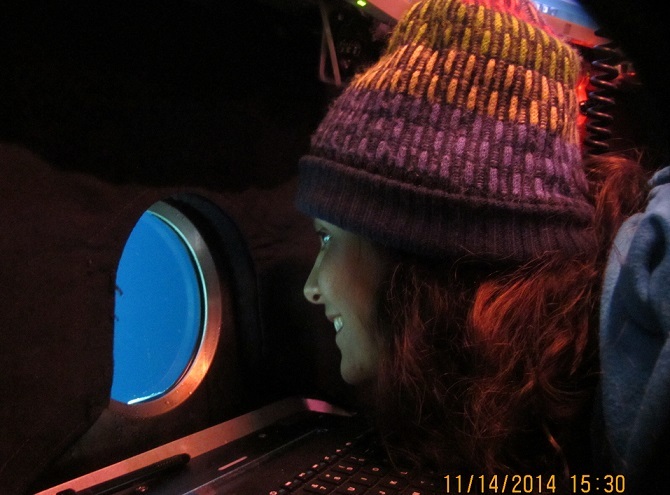 Being out here has been an incredible opportunity to better know the Ocean. And for that, there is nothing like a dive in Alvin. The inside of the sphere is quite similar to the Apollo spacecraft you can see in the Smithsonian’s National Air and Space Museum in Washington, a tiny space full of buttons but without seats. A ride in Alvin is actually quite peaceful, and the views are spectacular. At first, what shocked me most was how full of life the Ocean is regardless of what I have read about him being mostly a blue dessert. The dive started with an unexpected visit from a manta ray that hung out with us for a little bit. It was impressive to see her flying around the sub over and over with curiosity. During the descent, the lights from bioluminescent organisms accompanied us all the way down except at the depths of the oxygen minimum zone, where we were completely surrounded by the dark. But even that cannot prepare you for the explosion of diversity in the vents. I felt like we were entering a subaquatic garden where the dominants colors were white, red and yellow. Later that day, once I was back on Atlantis, I looked at the Ocean with a new awareness of his enormousness and importance for the whole planet. In that very same moment I knew that this was my first but not last cruise, as now my heart has been stolen by the deep blue sea. Since third grade, I aspired to be a geologist. 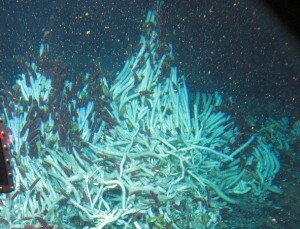 In middle school, I was exposed to hydrothermal vents and the remarkable ecosystems they hosted. From then on I knew what I wanted to focus on. While it was a dream of mine, I never really knew when the time would come that I would have the opportunity study and research them. Fortunately for me I was attending a university with Professor Scott White who not only dedicates his research to marine geology but was willing to let me get in on the action as an undergraduate. Now, instead of going to the local library throughout middle and high school to learn about hydrothermal vents and dedicating every project possible to them, I was working on a research project to further our understanding of the distribution of hydrothermal chimneys. A couple of years later, I am aboard Atlantis on my first cruise, hearing the hatch shut on the Alvin submersible that I had read stories about as a teenager. I did not have much idea of what to expect for my dive, with good reason. No one had ever been to where we were going, nearly 2,700 meters below the surface. This made me nervous, because to do my part I would have to describe things I had never seen or seen only in pictures. From various sources I knew I would see something reminiscent of volcanic activity, likely covered by sediment. As we approached the seafloor I saw pillow basalts (large round tubes of rock shaped like a dollop of toothpaste on a toothbrush) that looked as if they had just been snowed on with sediment. Just as with snow, you could see only what was poking out above the layer of sediment. But as we got closer I saw objects on the basalt and sediment, and some of them were moving! There was a community of organisms slowly going about their business in their surprising pink, orange, red, purple, and white colors. As all these things sank in, I began to comprehend what I was seeing as time. Fresh basalt would not have had time to accumulate sediment or organisms. What I was seeing was time elapsed from when the lava erupted. In geologic time, eruptions are very brief events with destructive potential. I was seeing not only a snapshot of the aftermath of such an event but its transition to a remote habitat for life. Many features in geology have existed for tens, hundreds, thousands, or millions of times the length of our life spans. In my short time as an undergrad, I have visited numerous sites of geologic features that formed millions of years ago. Despite holding rocks and fossils that represent them, time had never struck me the way it did in the first few moments of seeing the seafloor from Alvin. Maybe it was the mystery of not knowing the date of the flows and having no way of knowing how long it takes for sediment to accumulate. Come time to start recording what I was seeing, I was at a loss for words and had no idea where to begin. There were all these animals I didn’t know the names for. Majoring in marine science and geology, I found everything about the dive fascinating. I had to remind myself that I was wearing my geology hat and had to focus on describing what I was seeing and any changes in terrain. Everything about my dive was spectacular and included all sorts of new experiences. From moving up steep hills of pillow basalts to investigating craters, stumbling upon a lava collapse, and passing over a fissure, too… It was a real adventure. Along with the sediment, the pale, ghost-like, slow moving fish with open-jaw expressions gave the dive a sunken-ship-turned-artificial-reef feel. There was more life than I expected; many of the animals I saw were doing the opposite of what I would anticipate. I saw polychaete worms swimming through the water, a motionless octopus perched in the open sediment, and mostly stationary brittle stars taking off with surprising speed as we took sediment cores. The whole dive was like visiting another world. I’d like to thank the crew, the Alvin team, and the scientists for an eye-opening experience. A special thanks to Scott White for bringing me along for this unbelievable opportunity. A few days ago, one of my dreams came true. Ever since I started studying microbes living in deep-sea hydrothermal environments, I have wished I could dive to the deep sea and see the vent communities with my own eyes. This desire became my motivation to push forward with my Ph.D. study. 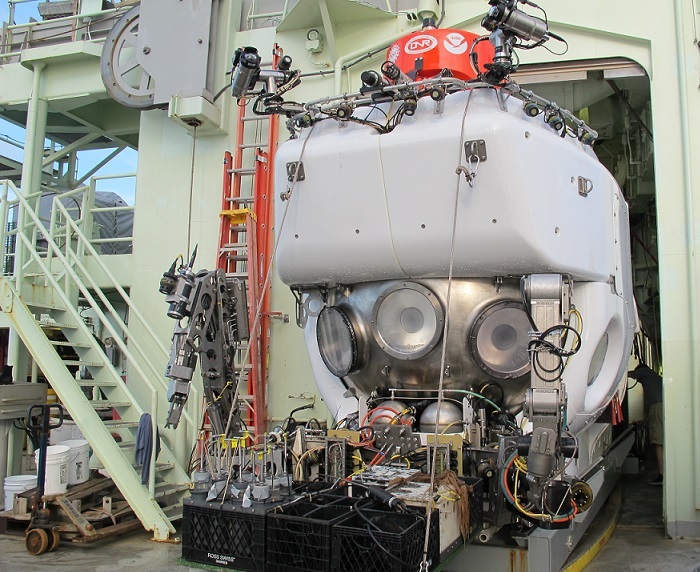 Before this cruise, I had opportunities to join the Japanese scientific cruises and see the deep-sea vents through video. But I have never had a dive in Shinkai 6500 (the Japanese sub), because students are not allowed to dive (in contrast to Alvin, there are two pilots and only one scientific observer in Shinkai 6500). So I was excited and could not sleep well the day before my Alvin dive. After Alvin started descending, the motions I had felt at the surface stopped. 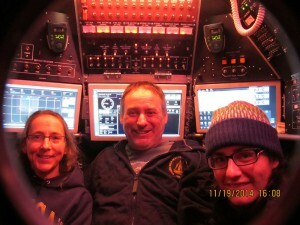 It was completely dark when we passed a depth of around 300 meters. No motions, no lights, no sounds… we would not know where we were without the GPS, depth gauges, and some electronic devices. Also beautiful bioluminescent organisms reminded me that we were going down, because they appeared to be going up slowly. The first view after we arrived at the bottom was the shiny black basalt. I saw delicate submarine formations; some parts were crumbled, and others were wall-like structures. We looked for the Vent-SID, which had been sent down earlier, and moved it to a site near thriving Riftia (giant tube worm) colonies. I could not believe their lives are completely supported by the activities of tiny microbes. 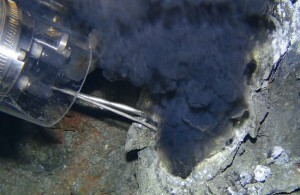 The pilot, Bob Waters, took us to a vent called P-vent and showed me more black smokers. I had tears in my eyes (though I was looking out through the small window, so I hope nobody saw…). The height of the chimney was over 10 meters. I have no idea how long it takes to grow such a huge structure, but I felt the beating of the earth with the continuous emitting of vent fluids, and that was the thing I really wanted to observe with my own eyes. We finished collecting high-temperature fluids and chimneys at P-vent, then headed to the Crab Spa, and successfully collected a couple of IGTs (vent fluid samples) and rock samples. The hydrothermal activity was never boring to watch. I wished I could have stayed there longer, but we had to leave the bottom of the ocean and go back to the real world. 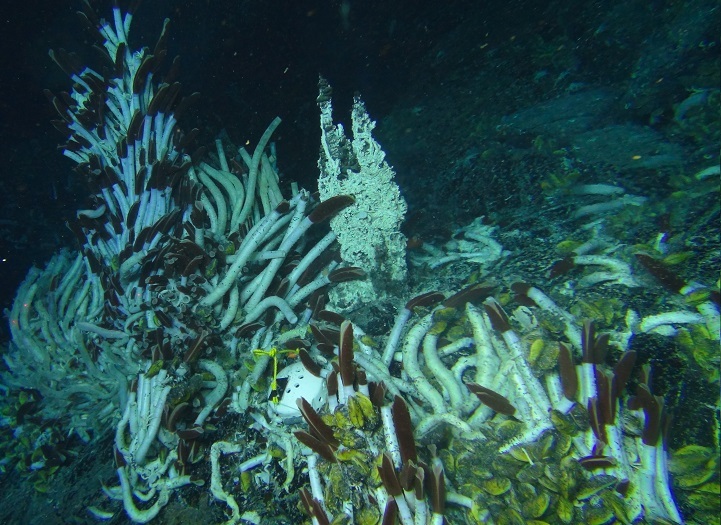 The dive was like a dream (of course there were tube worms in my dreams after the dive!). But I am sure we saw the energy-filled dark life, which we cannot feel from watching videos. I would like to express great thanks to chief scientist Stefan Sievert, who provided me with this wonderful experience. 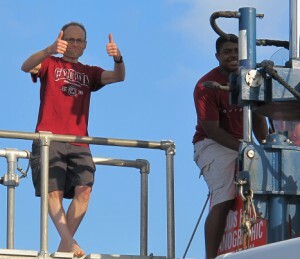 Also I appreciate the Atlantis and Alvin crews for supporting safe cruises and dives, and the scientists for sharing the good times and preparing a great initiation for me. 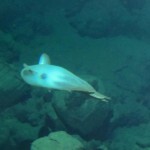 I’ve promised myself that I will work hard to hopefully get another opportunity to dive to the seafloor again someday. I am a master’s student from Germany and have been working on my thesis in the laboratory of Stefan Sievert since the beginning of April 2014. Together with Jesse McNichol, I worked on a model microorganism called Sulfurimonas denitrificans to aid in the understanding of a bacterial group that appears in high numbers in hydrothermal vent fluids. If anyone had told me at the beginning of April that I would go diving with the Alvin submarine to an unknown place at the bottom of the ocean at 2700 meters, I would have never believed it. But on Wednesday, November 20, 2014, I did it. 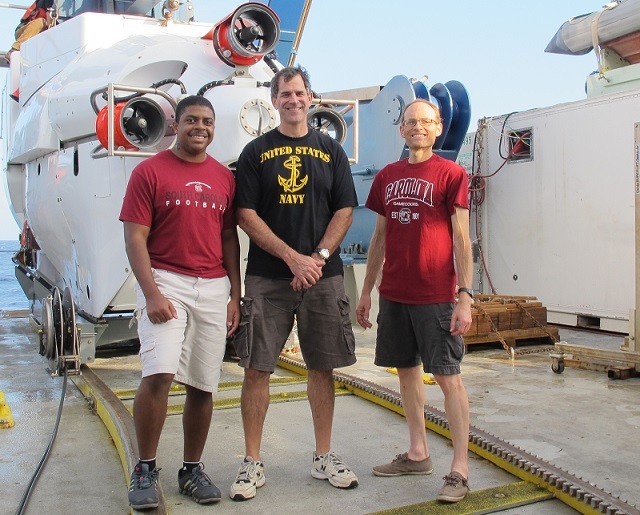 Together with Scott White, a professor from the University of South Carolina, and Bruce Strickrott, an experienced Alvin pilot, I went down to the bottom of the ocean with the aim of finding new hydrothermal vent sites off-axis to the East Pacific Rise. I have done a lot of recreational diving, and the first thing I noticed when the Alvin dive started was that the light reached down to a depth of almost 200 meters. There were stripes of weak green; it was not fully dark. But afterwards our surroundings turned deep black. 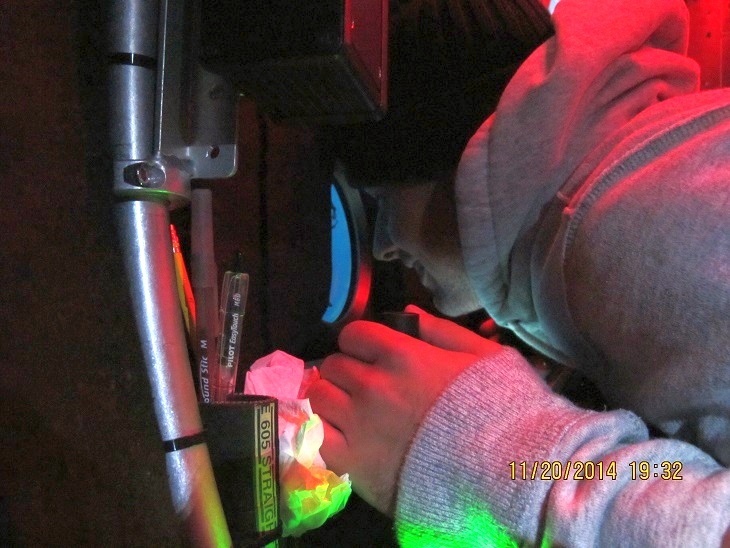 We shut down the lights to save energy during the descent, and when you looked out one of the five windows you could see little organisms passing by creating a green light through the process of bioluminescence. For me it looked like flying through the galaxy. After more than an hour, we came close to the bottom and turned on the lights. I could not believe my eyes when the bottom appeared out of the deep blue and came closer and closer. 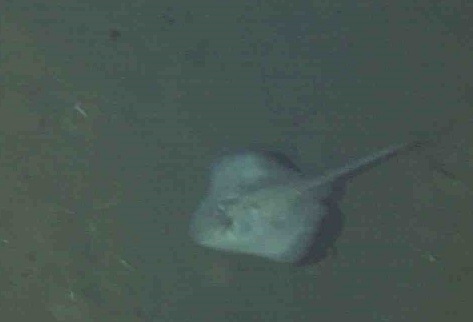 We landed on a flat sediment area and it was amazing to see so much life in this habitat in the first glimpse I had. Big fish were hovering head down in the dark. They had a big white head and a thin long tail. Others looked like white eels. The whole surface of the seafloor seemed to move: sea stars of all kinds, shrimps, and crabs were moving in every direction trying to hide from the light. For them it probably was the first light they have ever seen. 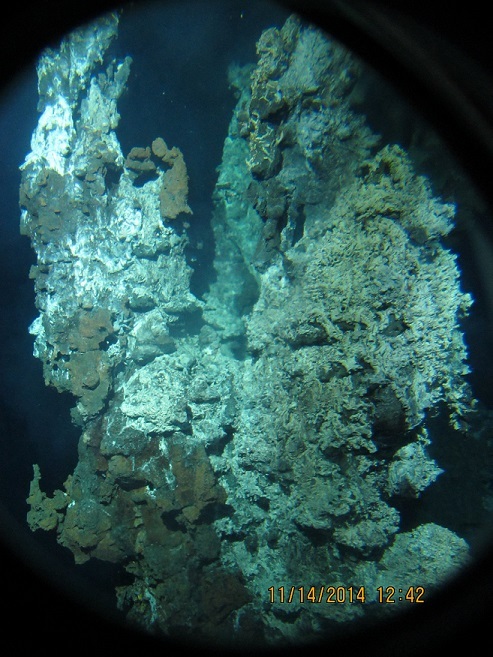 We started towards an area 1 to 2 kilometers above a magma chamber to look for hydrothermal vent activity. 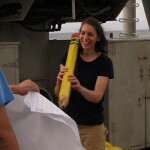 For the first few minutes we were flying over the sediment bottom and took also a sediment core sample. After a short time, the first structures appeared out of the sediment. Rocks covered in sediment became numerous. Some of these rocks were home to deep purple anemones, white sponges, white corals, and sea cucumbers in many different forms and colors. We flew over a more rocky area. Suddenly a big white shadow appeared to the left of the submarine that nobody else could see. 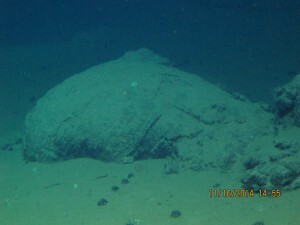 When it came closer to the sub the shape looked like a white turtle swimming slowly away. I said to the pilot: “There is a white turtle swimming away on the left side of the sub.” We turned and drove closer to it. The “white turtle” was a huge dumbo octopus. On its body two white wings (shaped like shark fins) enabled the octopus to swim calmly through the water. An hour later as we were sampling a rock and two sediment cores, another white shadow was laying in the sand in front of us. 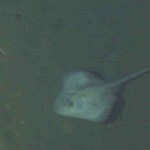 We sneaked towards it and saw a big white sting ray lying in the sand. When we came too close, it swam towards the sub and passed underneath. We continued to sample rocks and sediment cores along the dive route. We flew back towards the East Pacific Rise axis. We flew over old pillow lava, sheet lava, and lava channels. These formations looked a bit like the fingers of a giant coming out of the sand. We approached the edges and dove down steps several meters tall. Finally we moved upslope toward the East Pacific Rise axis where we also took some samples until we had to finish the dive. We did not find new hydrothermal vents or diffuse flows, although we explored many rocks and many cracks in the seafloor. We brought up nice rock samples, whose age still has to be determined, and sediment cores that will be investigated for microbial diversity. We drove a distance of more than 3 kilometers at depths from more than 2700 meters up to 2500 meters. When we ascended, the bioluminescence looked like green rain pouring onto the sub. It was an adventure I will never forget in my entire life. I want to thank Stefan Sievert, Scott White, and Bruce Strickrott for giving me this once-in-a-lifetime experience! Editor’s note: Among his lab-mates in Woods Hole, Florian is famous for his spirited karaoke performances. When he returned from his dive, he was handed his favorite neon green safety goggles and a prop mike. 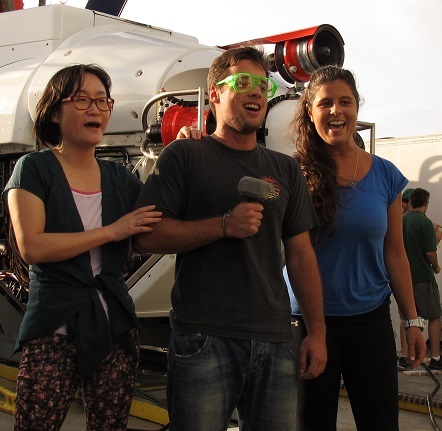 With fabulous backup from Fengping Wang and Camila Negrão Signori, he treated us to a modified rendition of his favorite song, Red Hot Chili Peppers’ “Under the Bridge,” before being doused with iced seawater for his Alvin initiation. 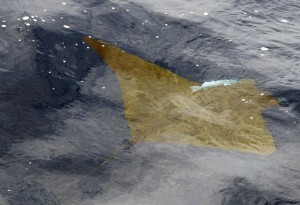 A ray circled Atlantis and saw Alvin off during Wednesday’s launch. On Wednesday, pilot Bob Waters, microbiologist KT Scott, and postdoc Nuria Fernandez Gonzalez headed down to the vents to find the Vent-SID microbial incubator that we’d deployed the day before. 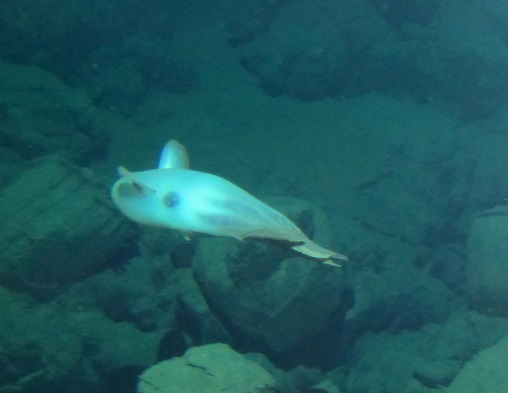 A large ray swung by to wish them a successful dive, and they watched it swim around the sub through the viewports before starting their descent. At the bottom, the divers sent the Vent-SID back to the surface and collected several samples of vent fluids, some tube worms, and chunks of a black-smoker vent structure. A hydraulic line on one of Alvin’s manipulator arms got nicked at the black smoker, so the sub surfaced a little earlier than planned, but the Alvin group got everything into shape for the next day’s dive. Craig Taylor rinses the Vent-SID with fresh water after recovery from the seafloor. The Vent-SID’s final deployment was our most successful yet. 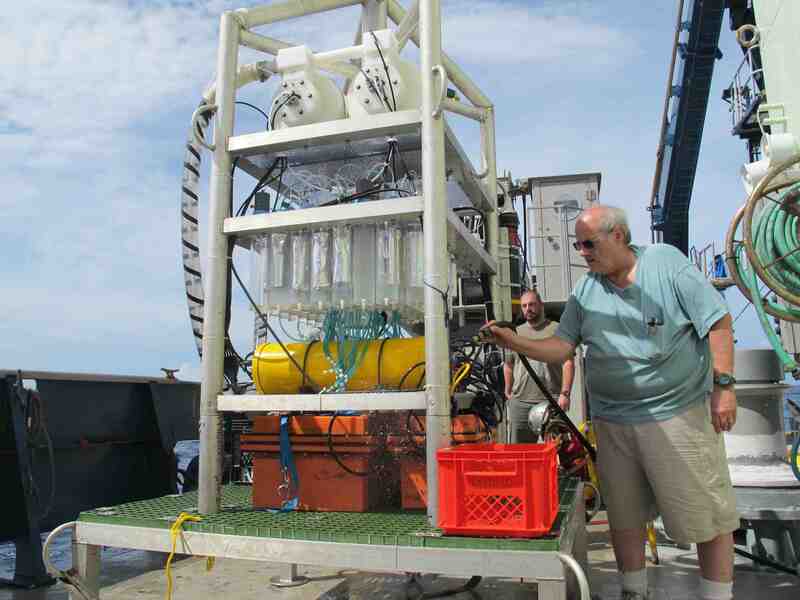 It returned to the surface full of samples that had incubated on the seafloor. 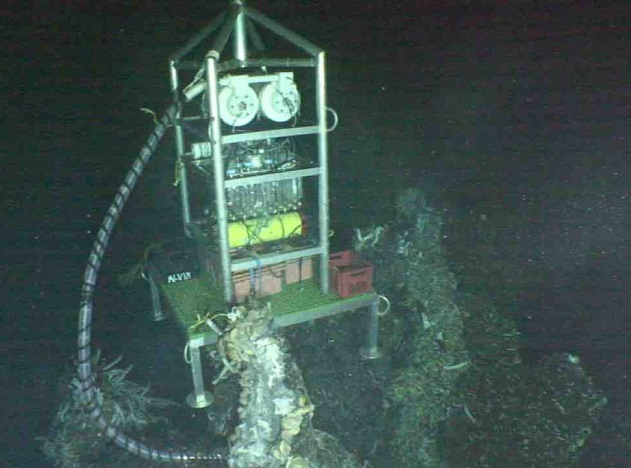 The instrument is designed to measure the rates at which microbes perform certain biochemical processes under the conditions of their natural environments at the vents. 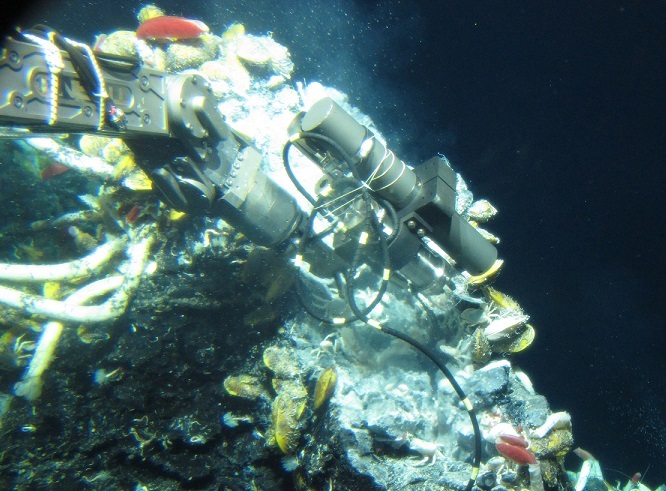 Microbes are the base of the food chain at hydrothermal vents, so understanding how they work is an important part of understanding the whole vent ecosystem. The Vent-SID, the latest version of the SID family of instruments developed by Craig Taylor and engineers at WHOI, works by pulling vent fluids rich with microbes into its insulated glass incubation chambers and keeping them at the temperature of the vent, something that has never been done before. At regular intervals over the next few hours, the instrument takes samples of the fluid in the chamber and preserves them, so the researchers can determine what microbes are present and what their activities are. 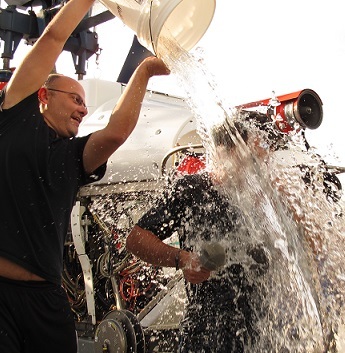 These measurements will tell the scientists how productive vent ecosystems are and help them get a better idea of their importance for biogeochemical cycling in the ocean. First-time Alvin diver Nuria has been hard at work throughout the cruise preparing the Vent-SID for its deployments and processing samples. When she returned to the ship after her dive, she was crowned the Vent-SID Queen with a garland of sample bags and a tubing necklace before she received her ice-bucket initiation. In local sports news: The all-hands ping-pong tournament has been heating up over the last few days. Alas, the two top-performing scientists on board, Jeff Seewald and Stefan Sievert, were eliminated in the semifinals. They now join those of us (ahem) battling for third place overall in the consolation bracket. Tomorrow morning, ordinary seaman Ronnie Whims faces bosun Patrick Hennessy in the championship match. 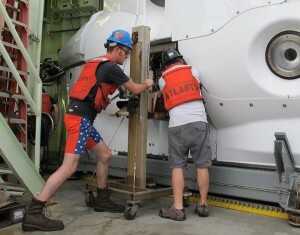 Alvin technician and pilot-in-training Jefferson Grau attaches the sub to the A-frame before a launch. One of the questions that we in the Alvin operations group get asked, perhaps more than any other, is “How did you get this job?” And the thing is, each one of us, technicians and pilots, has a very different answer, both in terms of practical career choices and in terms of the motivations that brought us to this strange life aboard the good ship Atlantis. Some of us have, in a past life, worked with underwater technologies related to submersibles, and all of us have some sort of mechanical or electrical background, but the common denominator among us all seems to be that there is no common denominator. When the question is presented to me, a lot of times I flash back to the submarines my friend Dave and I built when we were ten years old. I can’t honestly say they were particularly functional, in the traditional sense, as they were constructed of two high-back wooden chairs with a quilt draped over the top. We stocked them with broken car radios my mom gave to us so we would have lots of buttons to push, but the only communications we’d reliably pick up were whale songs from a floppy record that we found in an old issue of National Geographic. Excursions from the personnel sphere were periodically required to turn the record over. I remained fascinated with both the ocean and space sciences in the intervening years (to me they were two faces of the same beast), but I didn’t consciously pursue deep submergence as I approached college. Had anyone suggested working with a manned research submersible, I would’ve found it about as reasonable, as professional goals go, as a career on Titan. Instead I worked for a small aerospace company for a couple of years, but found (as many of my Alvin colleagues today will attest) that days of computer design behind a desk was becoming increasingly untenable in the face of… well, something else. But what, exactly, I didn’t know, though I suspected it would take me back towards the blue outer spaces here on our own planet. A new stint as a bartender & bike courier in Boston afforded in flexibility what it perhaps lacked in compensation, and I was able to volunteer each Friday at the New England Aquarium. Spending all day with the Dive Department and their Giant Ocean Tank reignited my interest in the ocean, in just spending time underwater. I eventually found myself enrolled in an eight-month full-time commercial diving program, but as with many of the “career” moves I’d made thus far, I hadn’t really figured out how I would tie this to work with the science community or ocean exploration. While I was working with an offshore dive operation in the Gulf of Mexico, a new scientist friend mentioned his descents in Alvin, and something snapped in me when I realized that mere mortals might, under the right circumstances, find themselves ten thousand feet down in its cold metal sphere. I moved on to working dive operations in nuclear power plants around the Northeast, which enabled me to focus more aggressively on the possibility of working with the Alvin group. It turned out that, after all of the tangents & turns I’d taken in my working life, I had ended up with a backstory that combined the technical and the practical, and was sufficiently broad & unorthodox as to make me a decent bet. After a period of borderline-pathological persistence on my part, I’m glad the Alvin group took an interest in me. They did not, however, take an interest in my broken car radios. 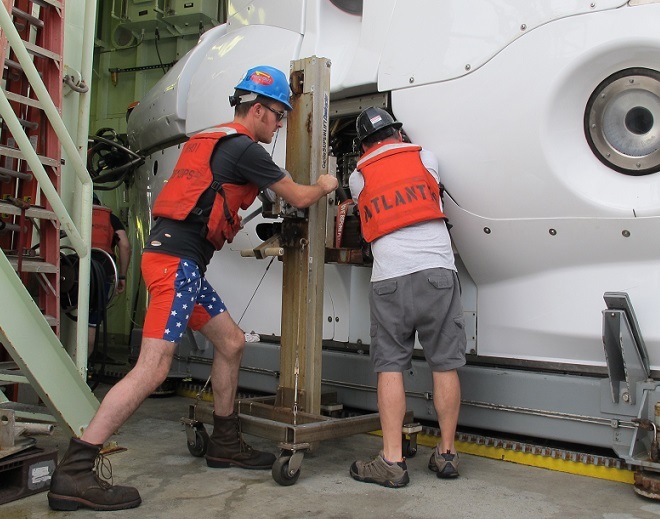 Monday was another catch-up and sample-processing day for the science group, while the Alvin team performed some maintenance on the sub’s variable ballast system. 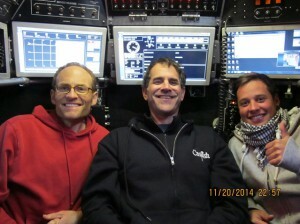 Then yesterday morning, pilot Phil Forte, chief scientist Stefan Sievert, and I (!) made our way to the seafloor in Alvin. 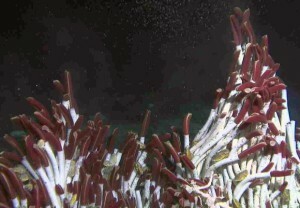 some microbial colonizers that had been deployed on the first dive of the expedition and gathered a hefty batch of tube worms for the scientists on Atlantis. Squally weather threatened to cut our work short, but luckily it cleared up and we were able to get through everything on our to-do list. 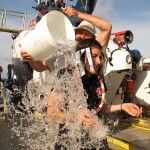 Once we were back aboard, I got my comeuppance for posting all those ice-bucket photos of previous newbie divers here on the expedition blog. 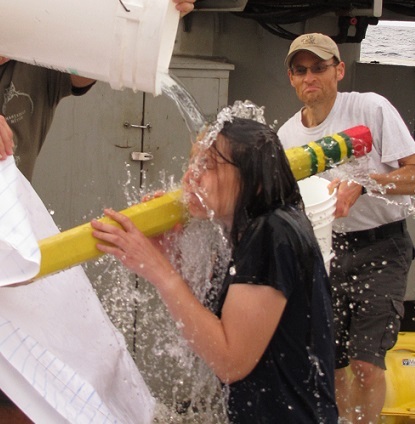 My thoughtful shipmates arranged an Alvin initiation ceremony that included some tools of my trade, plus the traditional buckets of iced seawater. I’ve never received a welcome that felt so warm (emotionally) and so cold (thermodynamically) at the same time. Thanks, everyone! Today, pilot and Alvin expedition leader Bob Waters, microbiologist Kathleen Scott, and postdoctoral researcher Nuria Fernandez Gonzalez dove on the vents. They sent the Vent-SID back to the surface. This deployment was our last chance to see it in action, so we’re anxiously waiting to find out whether it finally worked as planned! Stay tuned. Today’s dive is our last here on the main ridge of the East Pacific Rise. 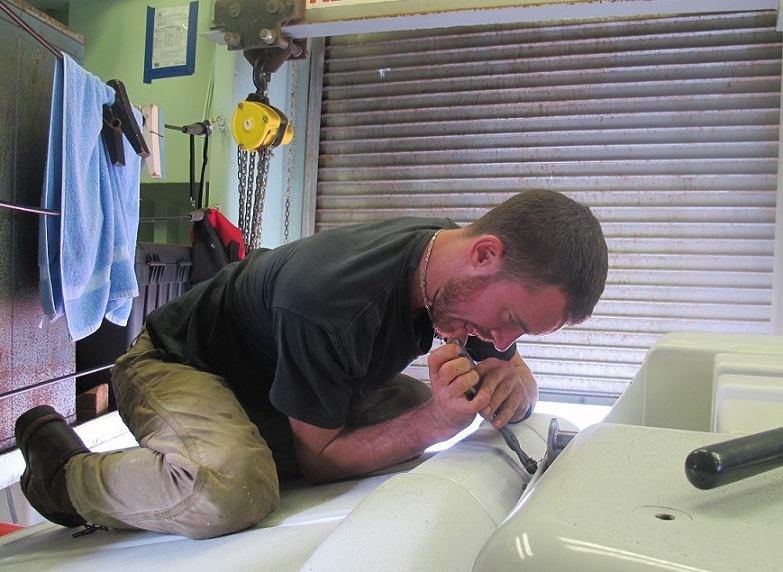 Tomorrow will bring more off-axis exploration as Scott White continues his search for new vents. 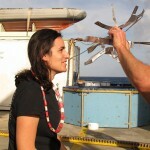 Stefan Sievert (left), Phil Forte (center), and Camila Negrão Signori in Alvin’s sphere. 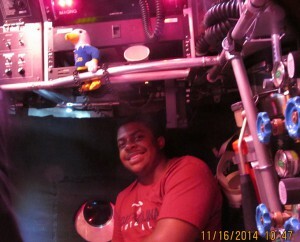 Being on the Atlantis/Alvin cruise itself is such an experience. 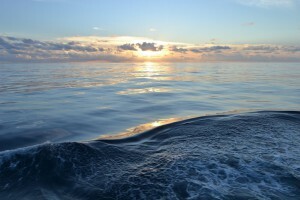 Since the beginning, everything is different compared to other traditional oceanographic cruises. Instead of navigating to distinct sampling stations, we stay at the same area (9° North) for almost a month. 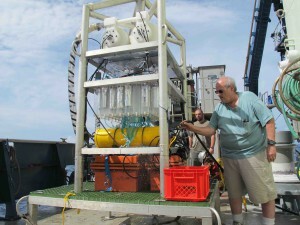 Besides the Niskin bottles coupled with the CTD-Rosette system [for collecting water samples from different depths], we have the famous sub Alvin diving to 2,500 meters almost every day to collect our samples (fluids from the vents, plenty of microbes, chimneys, tube worms, colonizers, etc). 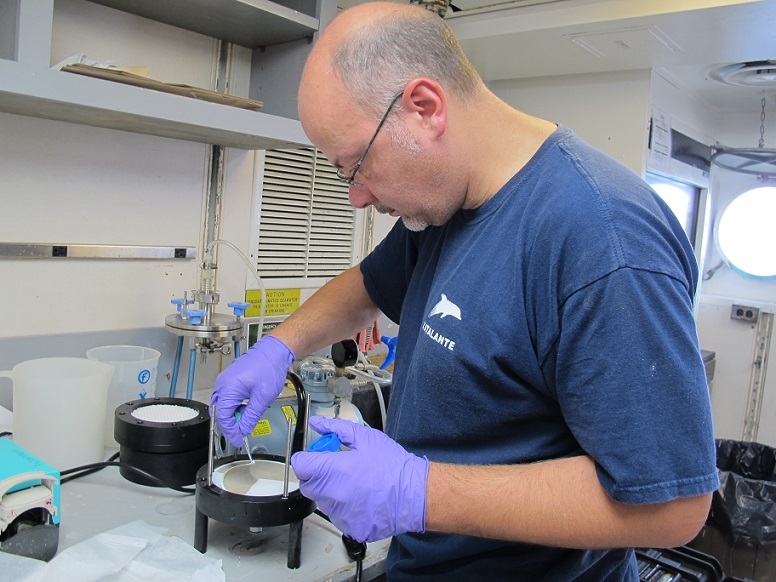 Instead of taking water samples from the bottles, we take samples from special pieces of equipment called “IGTs” (Isobaric Gas Tight samplers) that can maintain the in situ pressure and other environmental conditions from the deep sea vents. Dealing with the samples is not easy, at least for me! Besides all the protocols normally followed in the lab, we have to control the pressure, be careful when opening and closing the system, work with tools (whose names I don’t even know in Portuguese! ), and we have a lot of engineering. 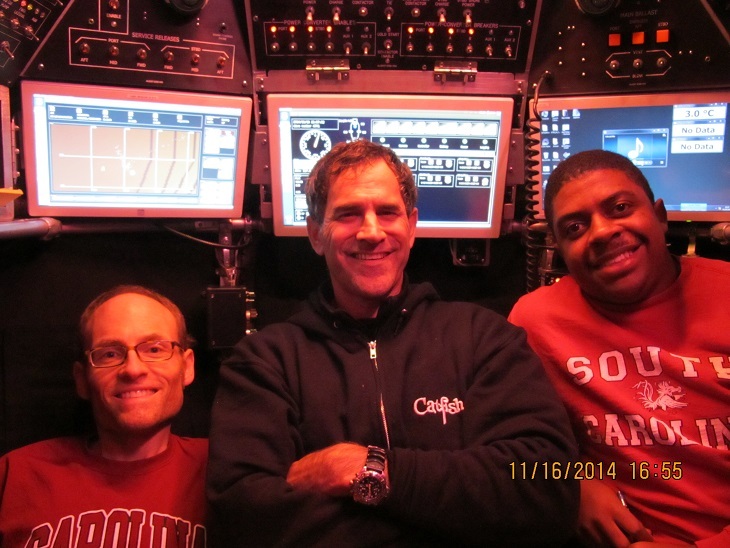 Having the chance to dive deep was one of my (almost impossible) dreams as an oceanographer that came true on Nov. 14, 2014. The first 100 meters of the water column are beautifully turquoise. Then it becomes more and more dark, and after 300 meters it is completely dark and calm, and some bioluminescent organisms appear floating sometimes. After a very smooth 1.5 hour descent, the pilot Phil Forte turns on the lights of Alvin and we land on the basaltic rock that makes up the seafloor at this location and start exploring the area. We saw a lot of life…several crabs, many tube worms, some fishes, shrimps, octopus, lobster, microbial mats. But what most impressed me was the geological structure, which seemed to be artistically sculptured, surrounded by the black smokers with plenty of activity. It was simply unbelievable, like those scenes that you only watch in movies. But luckily for me, it was real. Reflecting on my dive, I feel grateful, amazed, and blessed. I also feel so small…like a drop of water in the ocean or a tiny microbial cell shining in the microscope. Dive 4769: An experience that I will never forget. 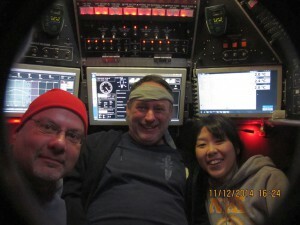 I am fondly thankful to Stefan Sievert, who gave me this chance to be on this cruise, as well as all the scientists and the Atlantis/Alvin crew, for sharing this experience with me and for all their efforts to make things happen. Muito obrigada! 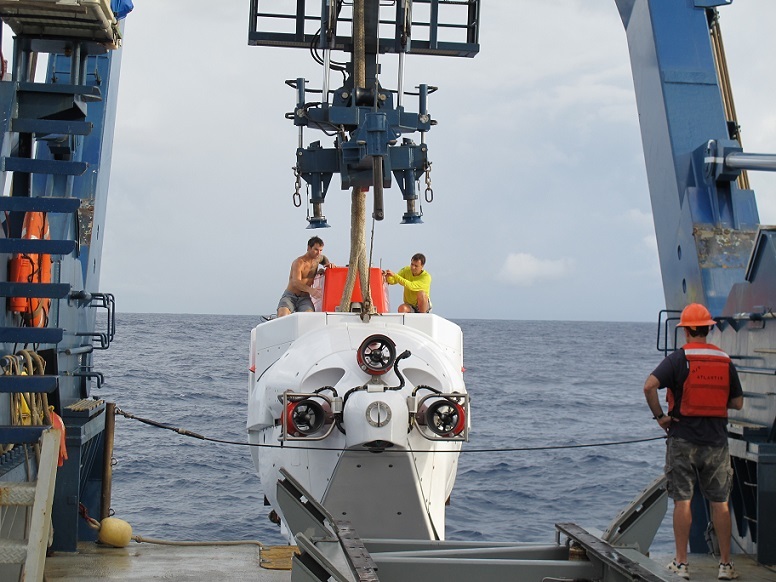 Today, pilot Bruce Strickrott, geophysicist Scott White, and undergraduate student Avery Lee dove in Alvin to do some off-axis exploration—that is, not directly on the mid-ocean ridge where the vents we’ve been studying so far are located. Seismic data show that there is some “melt,” or magma, off the ridge. If so, there may be undiscovered hydrothermal vent sites nearby. None were found today. 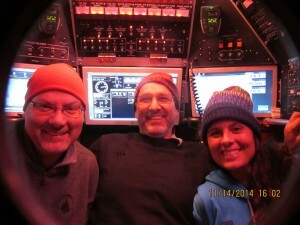 But Scott will continue his exploration on another dive a few days from now. 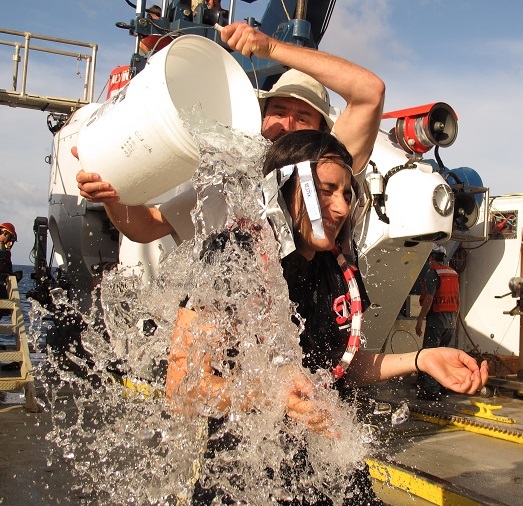 Meanwhile, newbie diver Avery returned aboard for his ice-bucket initiation ceremony. Stefan Sievert processes the filter from the Large Volume Pump. The brownish stuff is filtered microbes. Yesterday, pilot Bob Waters, pilot-in-training Chris Lathan, and research associate Sean Sylva dove to the vents. 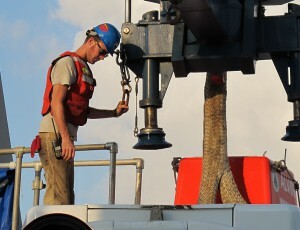 They located the Large Volume Pump, which had been deployed the day before. True to its name, the pump filters large volumes of vent fluid to sample microbes. The divers sent the pump back to the surface. 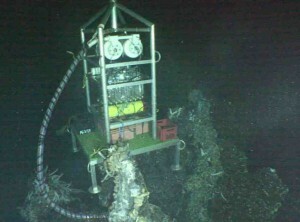 They also recovered a bacterial colonizer and collected vent fluids from two sites. The pump was sent down to the bottom again tonight. 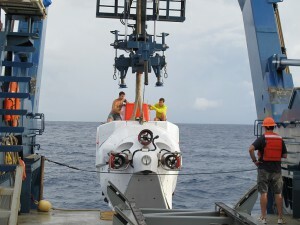 Tomorrow’s Alvin divers will find it and start the next round of microbe sampling. The Vent-SID group has continued their testing. They’ve done some successful short-term incubations near the surface and are getting ready for the instrument’s final deployment this week. Alvin parks in its hangar after today’s dive. When I wake up, my ‘reboot screen’ has lots of error messages (I am not a morning person), so my response was mostly expletives with a few prepositions tossed into the mix. Once reality had percolated into the miasma in my skull, I got quite excited. It turns out the day’s scheduled dive had to be changed because of an equipment issue, and they needed somebody who had directed an Alvin dive before, so there you have it. Rolled out of bed, scrubbed the worm guts out of my hair and fingernails, grabbed a doughnut and banana from the galley (no beverages; you do not want to have to pee while crammed into the rather tiny Alvin sphere with two other people), jumped in the sub, and down into the blue we go. We had a great dive, collecting many water samples at the bottom, as well as a bunch of Riftia tube worms. The Alvin has been rebuilt; the new version has five windows instead of 3, plus some amazing high-resolution video cameras, so you can see everything clear as day and it becomes hard to fathom (ha! ha!) that you are almost two miles below the surface of the ocean. It is very beautiful down there. The water coming up through the rocks is as warm as bathwater, and when it hits bottom water (2 Celsius), it shimmers. 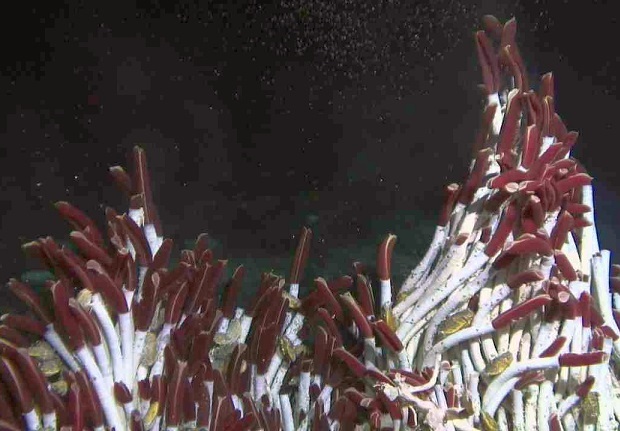 Down there you have these massive bushes of giant tube worms with huge red gills extending out of 6-foot tubes… They kinda look like lipsticks. OK, imagine shimmering water around giant lipsticks. Um. This isn’t quite communicating the magic and mystery of nature, but you know how it is. When something is really beautiful, words are crude tools, at best. So, it’s dark, and silent, and shimmering, with organisms that can best be described as hallucinatory, thriving on deadly gases that are released as the Earth’s crust rips itself apart at the seams… That works.